His screams were heard by nobody. It was... WEEGEE! "No! No!" screamed Javier at the top of his lungs, but it was no use. Weegee grabbed his head firmly, forcing his gaze into the green plumber's massive eyes. Suddenly, Javier could see everything. The universe, and all of it's marvels became known to him as he stared into Weegee's eyes. Weegee could likewise see into Javier's very soul through his eyes. Suddenly, the two beings became one. Weegee let go and dissipated into the darkness of the night. Javier stumbled clumsily, not sure what had just happened. He had seen God and all of creation in the blink of an eye, and knew all the dark secrets of the universe. 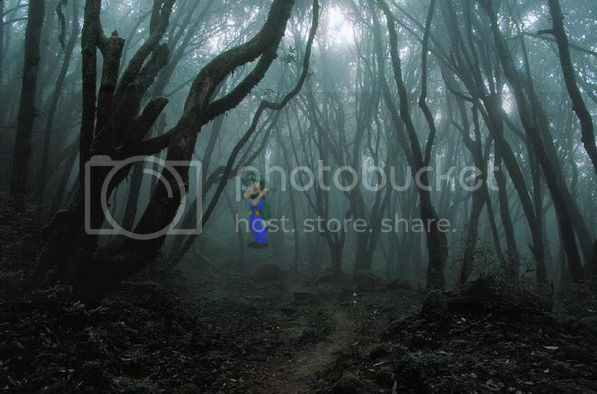 Javier took his camera, and tried to escape the dark woods. He stumbled upon a stream, and looking at his reflection, he saw... Weegee!